Peter Weiss is perhaps best known as a playwright, in particular for his play Marat / Sade which became an international success, staged by Peter Brook in New York and later adapted into a film. He continued to write prose, however, and his greatest work is often regarded to be The Aesthetics of Resistance, a three volume sequence, only the first volume of which seems to have been translated into English (and that was in 2005, thirty years after its first appearance). 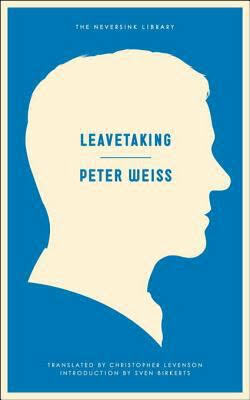 Leavetaking is an earlier (1961) autobiographical novella which was recently reprinted by Melville House in its original English translation by Christophe Levenson from 1968. He realises that “the home from which we had been thrust out had nevertheless embodied a security for us, and with its going the last symbol of our unity disappeared.” In this ending he remembers his beginnings, and a first house which has “large blind spots in it” due to his young age. Much of what follows comes in the impressionistic style of vivid but disconnected memories. This is juxtaposed with his discovery of his Jewish roots, something which he suggests saved him from the temptation of Nazism; this tie to the past will also free him as he must move away for safety, determined to make his dream of becoming an artist a reality. Though Weiss’ story of the artist as a young man is, in many ways, typical, it is the style of its telling which makes it worth reading. His impressionistic prose telescopes his defining years into a narrow space, cleverly mimicking the solipsistic viewpoint of childhood and adolescence while making each moment vivid for the reader. You are currently browsing the archives for the Peter Weiss category.